That Either can, after all, participate in for comprehensions involving multiple generators was a revelation of an earlier post. The above bug-report resulted in a debate about a proposal to fix Either by modifying it in such a way that it would behave like its right: RightProjection. This so-called right-biasing would therefore eliminate the need to specify which result you were interested in (and involve left and right being deprecated). However, not everyone agreed with this, with some calling for an alternative class to be introduced. So I ended up trying to do the patching myself, and against the odds, now appear to have succeeded. Rather than have left/right.map return an Either, it now returns a Left-/RightProjection. The patched Either is maintained in a Github project called scala-either-proj-map-returns-proj, including for comprehension tests, tests involving Option, and the test app from which the example above was taken. Feel free to build the project yourself, and add further tests that try to break something. EitherExtras is now in a package called org.lafros.scala, and licensed for use under the Apache v2.0 licence. 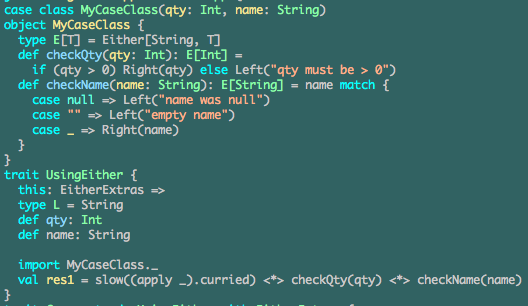 libraryDependencies += "org.lafros" %% "scala-either-extras" % "1.0"
or the following to your pom.xml. Many thanks to Sonatype for providing their publishing service, and to Josh Suereth et al. for providing instructions. 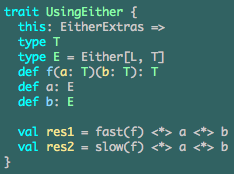 This is useful if you want to pass them to a function (and only do so if they're all valid). The initial version of the EitherExtras type class, introduced in my last post, has now been endowed with the necessary support. Here are some examples to show how to use it. <*> was chosen as the operator, for conformity with the Haskell language, since we're now using Either as an applicative functor. Here are some implementations and corresponding results. Please see the usingEitherApp to run this code yourself. 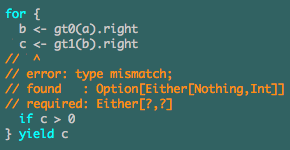 The next example shows how the above may be used together with the implicit methods for applying multiple checks to a single value (that EitherExtras provides already). Note that the two original methods (check, checkAndMap) have now become four (fastCheck, fastCheckAndMap, slowCheck, slowCheckAndMap), so as to allow either fail-fast or fail-slow application of the checks, as described above. Please see usingEitherApp2 for implementations and results, and to run the example yourself. 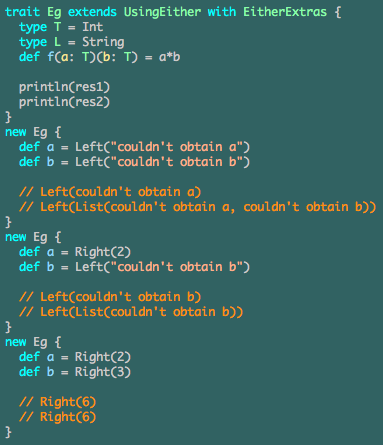 The final example is slightly less minimalist and abstract, and involves a case class. For implementations and results, and to run this example yourself, please see usingEitherApp3. Finally, I should mention that this latest effort was prompted (and the last example inspired) by a comment made by Chris Marshall in response to my previous post. 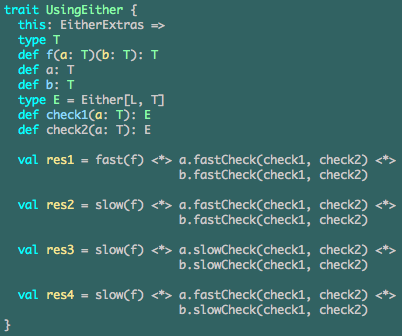 Again, help yourself to this new version of EitherExtras, which now occupies the master branch of the scala-either-extras project on Github - the original version has been moved to a new branch called simple.